Part city / part food tour, allowing you to explore the amazing neighbourhoods, historic buildings, epic parks and ocean vistas we have to offer, while rewarding yourself along the way with one of the things we love best about present day Victoria - food! If you’re a foodie on the lookout for a good adventure then this tour offers wonderful memories of life’s simple pleasures – fresh air, nature, and food that’s not only absolutely delicious, but that’s good for you too. Small Group Bicycle Tours of Victoria BC, Canada's Cycling Capital! All tours can come wrapped for gift giving! See the Purchase Gift Button in the Tour section to purchase and send to a love one this season! Ocean view rides along Dallas Rd! One of Victoria's lovely neighbourhoods! Have your delicious catered picnic lunch on the Discovery Tour oceanside! Chinatown with family always something to see! Big or Small we can held any family! Fun day riding around Victoria BC with 14 people! Always nice to have family support! My niece Danielle sporting Bike Tours Victoria t-shirt and exploring the coast line for interesting creatures! I love to share stories about Victoria's Past as well as the special environment we get to call home. Safety is always on my mind @ Bike Tours Victoria! Partnered with the top rental shop in town, Cycle BC. Bike Tours Victoria has a large selection of amazing bikes, scooters and motorcycles to choose from. We stick to Bicycles at Bike Tours Victoria! Warming up after a lovely sunny winter Bike Tour of Victoria BC. The Teahouse at Abkhazi Garden is an amazing hidden little Jem tucked a block away from some of the most amazing vistas of the Strait of Juan du Fuca and the Olympic Mountain ranges. Winter Holiday Bike Tours with Afternoon High Tea at the Abkhazi Garden. A lovely time for a food tasting on The Highlight Tour! Winter Bike Tours! The rain can't stop the fun, I just take you inside. Amazing people from all around the world explore cities by bikes! Tim made a video of his trip to British Columbia and his experience on my City Tour. Check it out and thanks Tim! 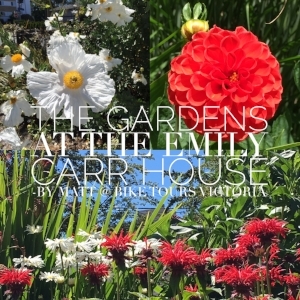 See what a custom Family Highlight Bicycle Tour of Victoria BC can look like! Thanks Jamie and Family for coming along!